Purchase this particular set and you’ll receive the beige cushions for free, saving you £220 on your purchase. The Dynasty Fire Pit set really is a feature to shout about, providing a unique outdoor dining experience this fire pit can be used as a small barbeque acting as a focus point for your guests, alternatively swap it for pit full of ice and you have the perfect place to chill some bubbly. The set comes with 4 beautifully moulded elegantly designed club chairs made from cast aluminium. They’re extremely comfortable due to their angled backs and rounded ornate tops. Both table and chairs are zinc coated making them incapable of rusting, meaning that this set will last you a lifetime. The quality of this dining set is second to none. The table top is cast from one piece enabling us to produce a smooth finish on all edges for your comfort. We understand that garden patios can be uneven, that’s why all of our fixtures have adjustable plastic caps on their feet to ensure you have a sturdy dining set for yourself and your guests to enjoy. 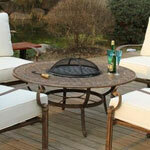 Rest assured our cushions are extremely high quality to match the standard of the Dynasty fire pit set. Each one is made from woven polyester which is UV protected and resistant to water damage. If you would like any more information on this product or have any questions, please get in touch today on the number provided. Alternatively visit our ‘contact us’ page and fill in our contact form, we will be in touch with you shortly. Ivycast uses high grade recycled aluminium for all cast and tubular aluminium products. Our table tops are cast in one piece enabling us to produce smooth finished surfaces with concentric designs. The legs are then bolted to the table top in situ allowing us to deliver our largest product through a normal sized doorway. Tables and chairs both have adjustable plastic feet that can be used to make an item level even on a wonky patio. The big thick cushions are damn comfortable and I love the way you can cook on it or fill it full of drink and get warm that way!!!! Great service as well by the way - thank you all round.